Starting an Art Yarn Pattern from Scratch. Are you a Designer or a Maker? This is one of my favorite knitting stitches, and referenced frequently in THISyarn patterns. Click on the videos below to learn how to knit this stitch! One of the main reasons we created THISyarn was to have patterns and projects to help sell the handspun yarn in your shop - be it online or brick & mortar. We want this publication to grow the economy of the entire fiber art community - from the wheel manufacturers around the world, to individual artisans spinning gorgeous yarns. This article is focused on successfully selling and promoting handspun art yarns in your Brick & Mortar shop. At Madison Wool, in addition to traditional hand knitting yarns, we carry an abundance of one of a kind, textured, handspun yarns. Here is how I organize the handspun inventory in my shop. 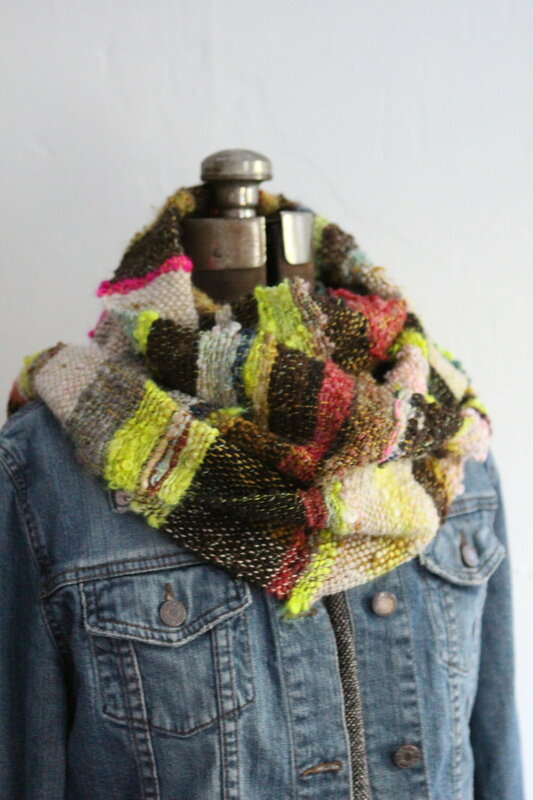 My Handspun: a blend of funky, plain/traditional and wearable pieces. If you are the sole creator of the yarns you sell, try and make different styles for maximum selling advantage. Other Artists Handspun: I strive to have a balance of styles, colors, and textures of fiber artists I enjoy. They are all different - so there is no competition for sales of similar types. It is always fun to see customers come in and always seem to buy a certain fiber artist’s yarn, due to either color or style. Make a note of this- you can then see what is popular, and try to spin in this style for maximum sales. The Pattern Follower: Doesn't want handspun. Maybe it’s not their style or aesthetic. Maybe they are allergic to natural fiber. Maybe they need a yarn that is machine washable. Maybe the specific project they have in mind (ie: socks or diaper covers) just isn't right for handspun art yarn. They shop for a commercial skein that easily fits into a pattern, and with enough yardage to complete exactly what they want to make. They are inspired by the pattern, and need a specific yarn to make what they want. The Creative Adventurer: They LOVE handspun. Handspun inventory is the reason they come to my shop. They travel miles, and they stock up. They know what to do, they don't need a pattern, they are willing to try new things, and mix it up. They create with confidence, regardless of yardage or gauge. They are inspired by the yarn, and don't need a pattern to create something they want. The Blossoming Wanderer: They are the ones who ask you "What can I make with THISyarn?" These customers are intrigued by the color or texture of a yarn, and they want to work with it, but they don't feel confident enough in their creativity to experiment without a pattern. They may look around at the samples hanging in your shop and want to make exactly what you've made. They may struggle to understand quick verbal instructions like, "Oh just cast on 5 inches and knit till you run out of yarn then bind off" - they need direction and specific instructions to make something they find beautiful. Here is where you come in. It's your job as a brick & mortar shop to provide inspiration for these blossoming wanderers coming into your shop. You are their guide into their own creative potential and artistic confidence. It's a role that you will be remembered for by them, forever. It's an honor and a privilege. Make Samples. Feel free to use any of the patterns we publish on THISyarn as the patterns in your shop (we just ask you credit THISyarn for the pattern). Patterns Sell Yarn. The biggest issue with making patterns with one-of-a-kind skeins of yarn is that customers will often want the exact yarns you used. Perhaps they've never experienced "one of a kind" skeins of yarn and are used to large dyelots and colorways. This is the first bridge you need to guide the wanderer over. Find The Color. Ask your customer about their favorite colors and find handspun yarns in the colorways that they find most beautiful. Then build a collection of handspun and commercial yarn from there to get the yardage needed for the pattern they have been inspired by in your shop. Remember to display patterns with all the styles of yarn you make / sell so customers can see how it works up. Embellish. Take a traditional pattern (like a hat) for millspun yarn and add a handspun yarn as an accent. This is perfect for small skeins of handspun, or to make a larger skein go further. With the popularity of gradient yarns and mini skeins, using smaller skeins of handspun in striping patterns would be fun too. The following are yarns that you should display in your samples if you sell them in your shop. These are the most popular textures in my shop and always get the most attention. This is a suggestion- use what you have and love! Knit on large needles (size 19-50) for a loosely knit scarf. 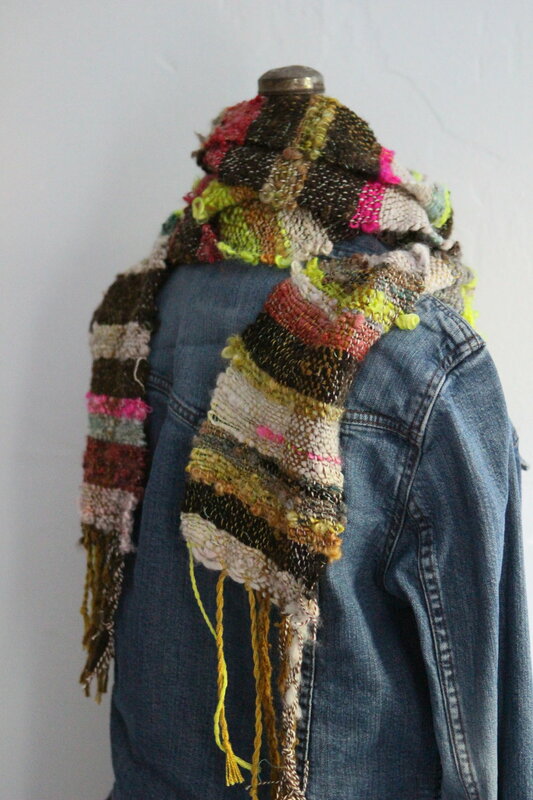 Remember to also feature crochet, weaving, macrame, and fiber art projects for handspun yarns. Your samples are the inspiration for the next generation of fiber artists. I have handspun yarn woven wall hangings on the walls of the shop, and one customer bought a rigid heddle loom and handspun yarn on the spot to make her own. She signed up for weaving class, and after weaving a few pieces, is now coming to learn to spin too. Guiding customers into new creative methods is one of my favorite things about owning a brick & mortar shop. We want to help you sell more yarn! Fill out the form to the right and we will send you a starter pack of 25 post cards or business cards for you to display or put with your handspun yarns, so your customers know there is a place to find patterns and inspiration for their one of a kind treasures. Thank you for helping us spread the word about what people can make with THISyarn. Here are my tips and tricks for working around extreme texture art yarn. For this cowl I used one skein of about 30 yards of extreme thick and thin textured art yarn and about 15 yards of commercial yarn to show how I use a "patching" technique for if I end up not having enough yardage for my project. Understanding the properties and characteristics of a yarn can help guide you to a project. Fiber Content: this may not always be listed on an art yarn. If it was spun from a complex batt, it may contain; wool, silk, sparkle, alpaca, angora, and more. Wool has ‘memory’ and can bounce back into shape. Alpaca and silk add softness and drape, but if it is mostly these fibers, it can lose it’s shape, so it wouldn’t be good for a project that gets lots of wear and tear. Softness: This is important when making things for yourself and others that is to be worn next to the skin (cowls, scarves, hats and some sweaters). Take the skein of yarn to your neck or back of wrist- sensitive areas. If it is soft enough, think of making something cozy for your neck, wrists, or head. This varies greatly- one person’s scratchy is another’s soft! Texture: If the yarn has lots of add-ins or locks, “texture”- you want to think about how to showcase this. Ideas are to use larger needles and elongated stitches. Yardage: Remember, if using highly textured yarn and large needles (35-50s), you can make a large infinity scarf or cowl with 30 yards or less! If you want a larger project, look to your stash or other commercial yarns at your LYS. All Art Yarns are not meant to be used in wearable garments! There are many creatively spun yarns that contain hemp, nettle, horsehair, etc that would be perfect for baskets, rugs, and other home projects. Give yourself permission to play - that means swatch! Get your hooks and needles or loom out and play a bit. Try different sizes and stitches to see what looks good. If you love a handspun skein and have the means to purchase it, do it! A project will always follow if you cannot think of one at that moment. More regrets are due to not purchasing one of a kind skeins when you had the chance. Sandy Ryan is the owner of Homestead Wool and Gift Farm with her husband Jim, located in Monroe, Wisconsin. She is a shepherdess, a prolific spinner (of yarn and tales), and dyer of some of the finest fiber and roving around. What kind of maker are you? I am a maker of a safe place for sheep to graze out their sweet little lives. They provide the beautiful fleeces I spin my yarn from. Art yarn is my favorite because I can just cut loose. With any fiber, yarn weight or trinkets spin right into the yarn. It gives me freedom to create from deep in my spirit. The sheep inspire me most. Their fleeces talk to me and tell me how they want to be spun. The exploration of that fleece, each color, texture is obvious to your eye. What intrigues me is how different each fleece is. As I work with it, shades of color emerge right before my very eyes. The fleeces are as unique as the sheep they came from. What is your favorite type of yarn to work with? I love to spin our lash yarn. (Tailspun). It is dramatic and really shows off each sheep. I also love spinning yarn that makes no sense. Any fiber, any color and lots of add-ins like yarn snips, sparkle and trinkets. What is your favorite method of making (knit/crochet/weave, etc)? Knitting is my favorite way to use my yarn. I am very novice but the handspun hides my mistakes quite nicely. My great grandma would have called that character! I also have a very basic knowledge of crochet and love to weave. Sleep is over rated right? What advice do you have for beginners using art yarn? Just have fun! Art yarn is sheep to spinner to you. Projects are a circle that brings us all together. There is no wrong way to use this yarn, it is just like any other-beautiful, versatile and exciting. It is as special as the sheep, the spinner and the creativity of each artist. Dare to find your own favorite path to create with art yarn! 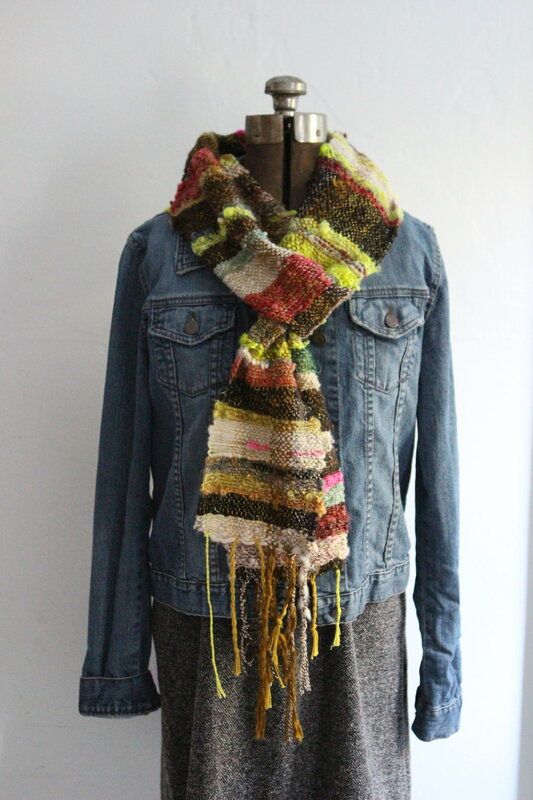 Below is a gallery of ways I had my mannequin wear a scarf made from handspun yarn. This scarf is about 7 feet long and has plenty of drape. 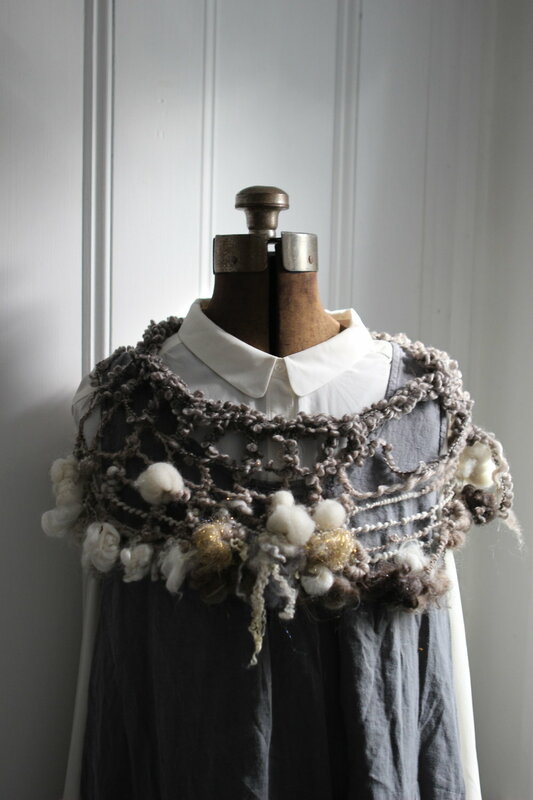 It was handwoven by Heather Lightbody of Girl with a Hook from her own handspun yarn. Below this gallery you'll find a video that has over 37 million views on YouTube - 25 ways to wear a scarf. I find this video tutorial super helpful when I'm styling my handspun yarn scarves and want to try something fresh - and wanted to share it with you just in case you haven't seen it already. Enjoy! Add 3 drops of Unicorn Rinse / Soft to a bowl of warm water. Soak your item in the bowl until saturated. Gently remove item from the bowl and press with a towel to remove excess water. Lay Flat or Pin on a Blocking Board to dry. Add 3 drops of Unicorn Rinse / Soft into a small spray bottle and fill with warm water. Lay out garment on a blocking board and pin into place. Spritz Rinse-Water over Entire Garment until Damp. After your yarn is spun, wind it off the bobbin using a niddy-noddy. Tie the yarn in 4 sections around the skein so it does not get tangled during the setting process. Fill up a bowl with warm water and add 2 drops of Fibre Rinse (scented) or Beyond Soft (unscented) to the water. Swish the rinse in the water. Place the yarn gently in the water and let it soak for 5 minutes. Gently remove the yarn from the water and hang in the shower or outside to dry. To speed up drying time, use a salad spinner or spin-dryer to remove excess water from the yarn before drying.